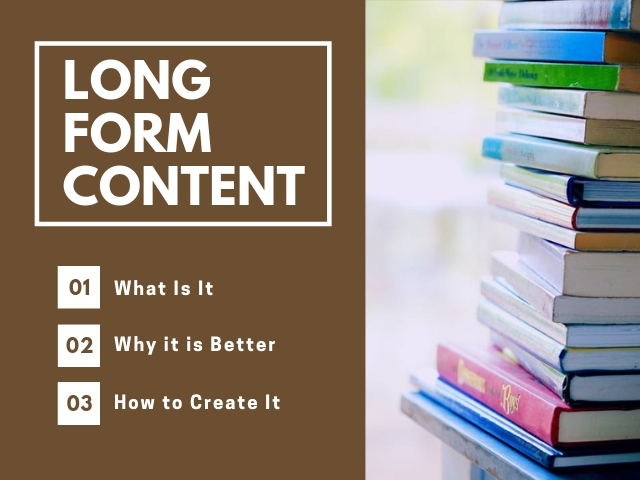 Long form content is a familiar word in the content marketing industry. But sometimes marketers get confused with the real meaning of the term. We cannot say any exact definition for the term long-form content. The number of words in a long-form content will be more than normal short contents of 500 words. You might have read at many places that long-form contents are more engaging than short-form contents. Long-form contents can always increase engagement among the audience. But just by creating a long-form content with 2000-3000 word is not enough to produce engagement. It should be of great quality too. If long-form content has to be successful, then you have to concentrate on giving valuable contents to your audience. Some research says that short-form contents can help to get more attention from the audience from long-form contents. The reason is that people don’t have much time to spend to read a whole article with so many words. If they get information, they want in the short form then they will consume that information. Why should you create long-form contents and why does it work? How to create long-form content? We cannot really find an actual definition for long-form content. It is an article with more than 2000 words and under 7500 words. If the word limit exceeds then we can call it as a novelette according to publishing terminology. So, we can call an article with around 2500 words as long-form content. To create an article with more than 2500 words needs a lot of effort from you. Why should you create long-form content and why does it work? There are many reasons to create long-form content. When you create content, you may have so many goals such as increasing audience engagement, number of social shares, better authority and good visibility online. To achieve these goals webmasters, try various options and one of the most effective option according to experts are creating long-form contents. By improving visibility, you can also get a better Google ranking. If you are looking for SEO benefits, long-form content can help you in a better way. Here are some SEO benefits you can get from creating long-form content. You can get more shares by creating long-form content. By creating long-form content you are providing good value to your audience through the content. When a reader gets something valuable it can get more audience and people will share those content within their contact. According to Buzzumo, the longer the content length, the more shares you get. Long-form content can help you to get ranked better. If your content has long-tail keywords there is a chance to rank better for those keywords. If readers spend more time on an article, Google gives more preference to those contents. In short, if Google has to rank keywords in a long-form and short-form content it gives preference to content where the audience spend more time. Are you familiar with a website like Kissmetrics, Hubspot, Moz, etc? All of them are the best guide to learn various aspects of content marketing. The main reason behind their authority is the long-form content they produce. You can check those websites for anything related to content marketing and management. The content created by these websites have a good authority among the audience and act as a good source of information to their audience. You can also be an expert in your niche by providing answers to everything related to your area. If your audience can find everything from your website then they are going to follow you. It will help to build a good authority among the audience too. If you are using your content to promote a brand or service, it can increase the conversion rate. Long-form content is better to get popular on social media also. Many websites include social media buttons within their article. If a user likes your content, they will share it on social media platforms. By getting more shares for your content there is a high chance of getting more quality inbound links to your website. It can automatically lead to more traffic and better ranking from Google. We have seen so many benefits of using long-form contents. We can say that by using long-form content, websites can get many benefits like better ranking, good engagement and many more. Do you want to know the reason? Webmasters are trying new strategies by switching each of them. Keyword optimization won’t bring much return traffic. Initially, it brings a lot of traffic, but for a website to grow well it is not enough. It has to provide good value to the audience to bring them back to the website. So, the best way to get more audience engagement, brand visibility, conversions and return traffic is to create long-form content. Create long-form content that can help to provide valuable knowledge to the audience. Just by creating long-form content your website cannot get benefit from it. You need to promote it on various platforms in order to improve its visibility. It can also help to bring your website to the top position of SERP. When research is conducted on the Medium platform an ideal blog post with around 1600 words will take 7 minutes to read. But sometimes the time that it takes to finish reading can vary from topic to topic. You can create long-form content easily by following the steps given below. To do this it is better to follow a particular strategy that can help you to be successful. What is the purpose of creating long-form content? Who will be reading this content? How will you measure content performance? On what basis you measure the success of your content? If you have answers to these questions then it will be easy for you to create content for the particular goal you have. Gated content can help to create more leads to your business. But there is a chance of losing many leads because of this sign up process. This is the most important stage in creating long-form content. You need to do good research and decide on the topic that can be used to write articles. To get a good idea about the best topics, you can check tools like Google trends. After picking your topic you need to define it for various types of buyers in the sales funnel. If you want to create awareness in buyers it is better to create broad articles. But for those who are in the later stage of the funnel will prefer more in-depth articles. So, you need to design your article according to their need for information. After selecting a topic, you can concentrate on keywords and other types of promotions to make it more visible. After choosing the best topics to write, you can hire someone who can write quality content. Most webmasters outsource writing to expert writers. Some others prefer to do it themselves. Both ways are good. But one thing you need to keep in mind is that it is always important to keep up good quality to the content than quantity. After creating good contents, you need to invest some time in designing and publishing it on your page. To make your page look good you can include attractive elements and arrange everything in an organized way in your page. Make the email sign up buttons attractive, include links to other pages, social sharing buttons, etc. If you are good at designing a web page you can do it. If not, you can hire an expert to do this task for you. Paid campaigns and ads can be helpful in making your content more visible online. You can create content promotional emails and marketing campaigns to spread your content to as many users as possible. Conduct contests and giveaways, try influencer marketing, social media promotion, ad campaigns, etc to promote your contents. Without a proper promotional strategy, it is very hard to make your content more popular online. These are some steps you can follow to create long-form contents. These are some tips you can try to make your long-form content more visible You can see some positive changes to your marketing efforts by trying these tips. There are a lot of confusions regarding long-form contents in the content marketing industry. Google values website that is highly informative to the audience. You must focus on engaging your audience by providing high-quality contents. Make them follow your website. If they find your content interesting, they will start following you. Implement the above strategies and measure your performance. Don’t expect a sudden change in your website performance. It will take some time for these changes to reflect on your website. So, what are you waiting for? Pick your topic and create a long-form content that can be beneficial to your audience.